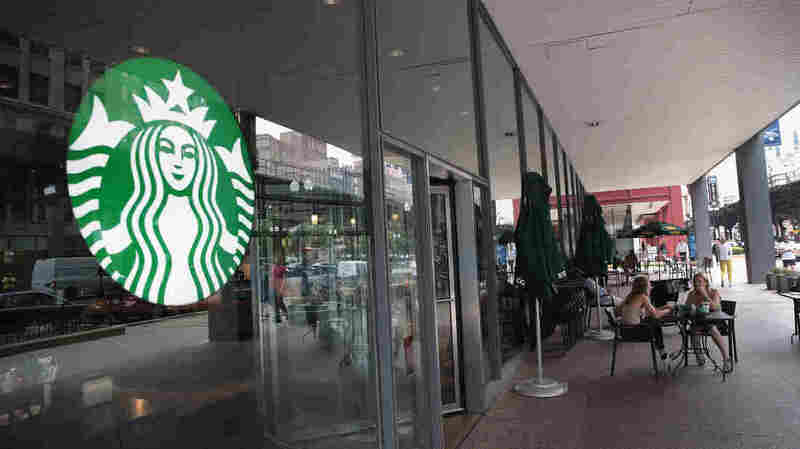 'I'm Not Aware Of That': Starbucks Employees Receive Racial Bias Training Starbucks closed thousands of stores across the country Tuesday for racial bias training. The sessions were closed to the public, but the company hosted an event for reporters in New York. Customers sit on the patio of a Chicago Starbucks store after it was closed on May 29. A viral video sparked outrage over the inappropriate arrest of two black men at a Philadelphia Starbucks last month. Now, the company is responding with videos of its own as part of the four-hour training session it rolled out for employees across the country on Tuesday. For the training, Starbucks commissioned a short film by award-winning documentarian Stanley Nelson about race in America. There's a moment when a black man faces the camera and talks about his own experiences being profiled in retail establishments. "I have to make sure that my hands are visible when I walk into certain places, so they make sure I'm not stealing," the man says. "I watch my tone to make sure I don't come off as threatening. Just leaving the house some days, it's enough to just keep you at home. Just keep you away from everything." After watching the video and others on racial anxiety and implicit bias, the employees talked with each other about their own reactions and experiences. "That made me just go 'wow, that's heavy.' And that's a lot to carry around," said Carrie Teeter, who manages a dozen Starbucks stores near Columbus Circle in Manhattan. She was one of the first Starbucks employees to participate in the training today in Brooklyn. "It first made me sad, and then it made me realize I'm not aware of that," she continued. "And I don't realize what impact that has on you, to constantly be feeling that way." Her African-American colleague Les Fable was not as surprised. He says he had similar experiences of being profiled growing up in Brooklyn. "You know, I have a 12-year-old son," he says. "And to look at those young men have those same experiences, it's like wait, maybe I need to have that conversation today." Starbucks closed more than 8,000 stores for the training on how to combat racial bias. The controversy was sparked by a video that showed two black men being led out of a Starbucks in handcuffs after a white manager called the police. The company quickly apologize for the incident, which it called "reprehensible." Starbucks reached an undisclosed settlement with the men who were arrested, and offered them a free college education. The woman who managed that store no longer works for the company. The training was voluntary. But all employees were "invited and encouraged" to attend. "I don't know of another company in the history of American business that's done anything remotely close to this," said Starbucks Chairman Howard Schultz. He has talked about this moment as a "transformation" for Starbucks. But people who study racial bias say that's asking a lot. "Training virtually never has any effect on people's bias," says Frank Dobbin, who teaches sociology at Harvard University. "And it's partly because bias is based on a lifetime of experiences with the media, and with real life." Dobbin says any benefits tend be short-lived. What works better, he says, is more diverse hiring at the management level. Even the designers of the curriculum acknowledged its limitations. "We actually shy away from the word 'training' altogether, because it's not quite possible to retrain our brains within a four-hour period," said Alexis McGill Johnson, co-founder of the Perception Institute, which helped design the sessions for Starbucks. She said the goal is to create "more awareness of how bias works," and to give Starbucks employees tools to apply that awareness on the job. Starbucks executives stressed that today's store closing is just a first step. There are plans for more employee training, and outsider advisers are looking at other steps the company can take. One of those advisers, former Attorney General Eric Holder, says that in some ways it's "disheartening" that these conversations still need to happen. "But when a company is willing to put the hard issues before us," he says, "I think those kinds of companies should be supported, should be applauded." Starbucks is making all of its training materials available for free Wednesday to anyone who wants to see them.